Disaster strikes as massive quantities of oil reach their intended destination. 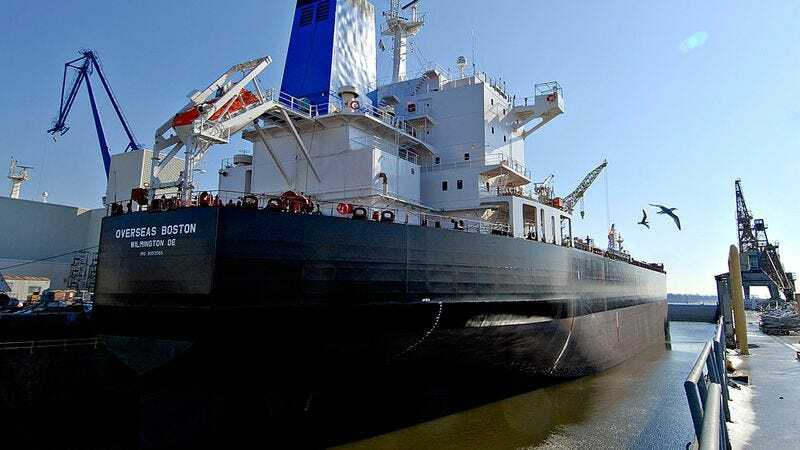 PORT FOURCHON, LA—In what may be the greatest environmental disaster in the nation's history, the supertanker TI Oceania docked without incident at the Louisiana Offshore Oil Port Monday and successfully unloaded 3.1 million barrels of dangerous crude oil into the United States. According to witnesses, the catastrophe began shortly after the tanker, which sailed unimpeded across the Gulf of Mexico, stopped safely at the harbor and made contact with oil company workers on the shore. Soon after, vast amounts of the black, toxic petroleum in the ship's hold were unloaded at an alarming rate into special storage containers on the mainland. "We're looking at a crisis of cataclysmic proportions," said Charles Hartsell, an environmental scientist at Tufts University. "In a matter of days, this oil may be refined into a lighter substance that, when burned as fuel in vehicles, homes, and businesses, will poison the earth's atmosphere on a terrifying scale." The oil could soon contaminate areas as far away as this Los Angeles freeway. "Time is of the essence," Hartsell added. "If this is allowed to continue, the health of every American could be put at risk." Officials predicted that the oil could be carried as far north as Minneapolis and as far west as Honolulu. Hopes of containment are said to be scant, as the pipelines transporting the oil are numerous, massive, and buried deep underground, making it virtually impossible to dig them all up and reverse their flow back toward the TI Oceania. "Our fear is that we'll start seeing this stuff in tanker trucks headed to gas stations all over America," Environmental Protection Agency official Ralph Linney said. "And once they start pumping it into individual cars for combustion, it's all over." "How can we possibly contain this after it's spread to 250 million vehicles, each one going in a different direction?" he added. Experts are saying the oil tanker safely reaching port could lead to dire ecological consequences on multiple levels, including rising temperatures, disappearing shorelines, the eradication of countless species, extreme weather events, complete economic collapse, droughts that surpass the Dust Bowl, disease, wildfires, widespread human starvation, and endless, bloody wars fought over increasingly scarce resources. Meanwhile, government officials, stunned to learn of the massive amounts of carbon dioxide that will be released into the atmosphere as a result of the TI Oceania tanker's successful docking, have called for a full investigation into the disaster's cause. "I am shocked and horrified by this development," Sen. James Inhofe (R-OK) said. "Rest assured, we will find the people responsible for allowing this to happen, and they will be held accountable. Every last one of them." Public opinion across the country has likewise turned from confusion to outrage, with many concerned Americans fearing that the worst may be yet to come. "It's scary stuff," said Logansport, IN native Wayne Cummings, talking to reporters from behind the wheel of an idling Ford F-150 XLT pickup. "I read somewhere that it might take years before we know the full extent of the damage, and by that time it will be impossible to do anything about it." "All I know is, we have to think of some way to fix this problem before it's too late," Cummings said before driving off. Noting that they have acted in strict accordance with U.S. laws and complied with the orders of federal regulators, representatives from ExxonMobil, BP, ConocoPhillips, the Kingdom of Saudi Arabia, and Chevron have all denied responsibility for the disaster.